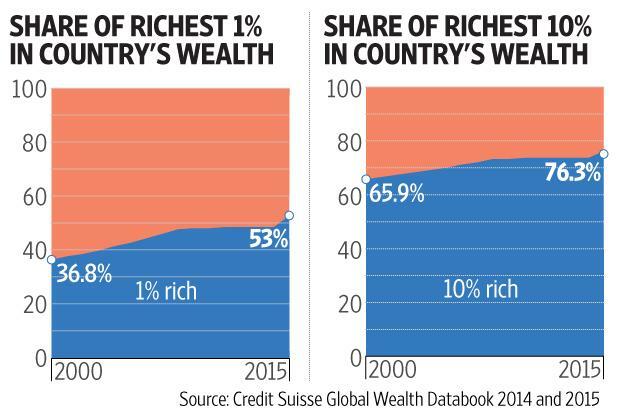 The richest 1% of Indians own 53% of the country’s wealth, according to the latest data on global wealth from Credit Suisse. The richest 5% own 68.6% of the country’s wealth, while the top 10% have 76.3%. India’s richest 1% owned just 36.8% of the country’s wealth in 2000, while the share of the top 10% was 65.9%. Since then the richest have managed to steadily increase their share of the pie, as the chart shows. This happened during the years of the National Democratic Alliance (NDA) government from 2000-04, during the first United Progressive Alliance (UPA) government backed by the Left, during the second UPA tenure and now in the first year of the Modi government; the share of the top 1% has now crossed 50%. The colour of the government has been no impediment to the steady rise in the riches of the wealthy. The difference between the share of the top 1% and that of the top 10% was 29.1 percentage points in 2000, but is down to 23.3 percentage points in 2015. In other words, the top 1% is eating into the share of the next 9%. The richest are growing at the expense of the relatively well-off. India’s wealth increased by $2.284 trillion between 2000 and 2015. Of this rise, the richest 1% got 61%, while the top 10% bagged 81%. The other 90% got the rest. The share of India’s richest 1% is more than than that of the top 1% of the US, who own a mere 37.3% of the total US wealth. But India’s finest still have a long way to go before they match Russia, where the top 1% own a stupendous 70.3% of the country’s wealth.